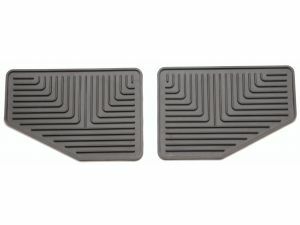 Rear Slush Floor Mats for the Jeep Wrangler are molded in color and feature deep ribs to trap and hold water, snow and mud to protect your carpet and keep it clean. A must during inclement weather, Slush Mats work great in all seasons. Rear, Set of 2. Please select color and model year above. Matched to the front except without the Jeep logo. Fit perfectly and bought at a good price. Just what I wanted, and I am very satisfied.